CAMP BLANDING, FL- The Assistant Secretary of the Army for Environment, Safety, and Occupational Health, Mr. Eugene Collins, presented the Environmental Restoration award to Camp Blanding Joint Training Center’s Environmental Program, Sep. 16, 2016. The CBJTC has received two prestigious environmental awards recently, the other being in 2014. “This award recognizes Camp Blanding Joint Training Center as having the very best Environmental Restoration program out of all Army posts,” said Col. Daniel “Matt” Johnson, commander, Camp Blanding Joint Training Center. “This recognition of the CBJTC Environmental team shows the Florida National Guard’s serious commitment to preserving and restoring the natural environment. Mr. Collins emphasized CBJTC’s ability to work as a team during the awards presentation. He took the time to acknowledge all of those involved, from the CBJTC leadership, to the program’s director and all of the staff that played an integral part in winning the prestigious award. Mr. Collins went on to state that restoring the 88-miles of swells of the St. John’s river project without additional funding, looked like a monumental task on paper, but the group’s dedication and teamwork saw it through to completion. After the award presentation, Mr. Collins toured the base and was given the opportunity to experience first-hand the program’s diligent work and dedication to restoring the land for future generations. 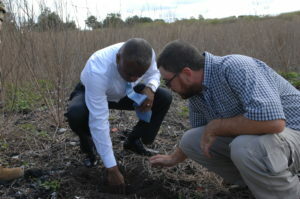 Mr. Eugene Collins, Assistant Secretary of the Army for Environment, Safety, and Occupational Health, surveys some of the restoration projects that are underway at Camp Blanding Joint Training Center’s Environmental Program, after presenting the CBJTC with the Environmental Restoration award. The CBJTC is being recognized for their efforts in environmental restoration.